Oooh, wow! They just look like piles of rocks until you look closely, and then suddenly so much detail. Cool! I'm totally obsessed with these little babies, and will be taking them to the Newport Center in September for Dragondaze (a comic & board game show). It will be my first ever event as a artist/trader so I'm super nervous about it! I relaunched Dragonwys on Patreon yesterday. I've had a few people comment about a 'dragon of the month' club, or subscription plan to purchase my baby dragons, and Pateron seemed to be the best way to go. Dragons are included with almost all of the reward options. 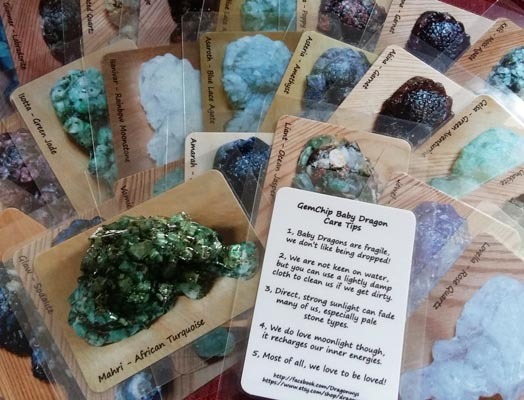 Special pic I've only released to you guys and my Patrons so far, new GemChip Baby Dragon Care Cards! 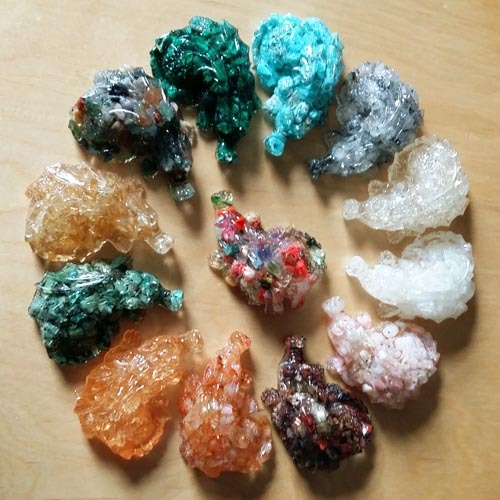 I wanted an easy way to show names and gemstone types at the Dragondaze show in September, so this was what I came up with! I think next year, I'm going as a visitor in costume, rather than as a trader. That way I can enjoy some gaming while I'm there. Well 5 is better than 0, but having a good weekend would be much better!